The first phase of Windstar Cruises' refurbishment of Wind Surf has been completed, and the ship has taken on a whole new look. Wind Surf's public rooms will undergo their own transformation next fall. 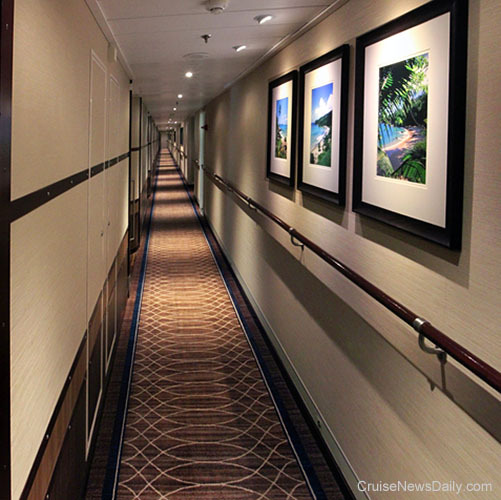 The staterooms and suites now have a smart new look with light colors and new lighting features. They now feature leather headboards, linen wall coverings, elegant window coverings, and wool carpeting. The rooms are accented by new artwork, stately arm chairs, and stylish bed cushions. 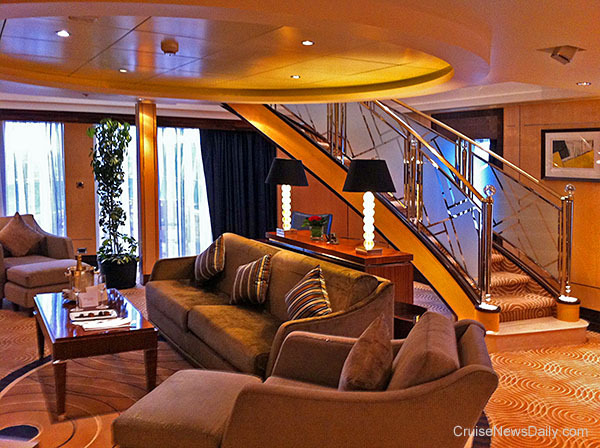 Suites now have furnishings that convert to lounging, dining or to accommodate a third passenger. 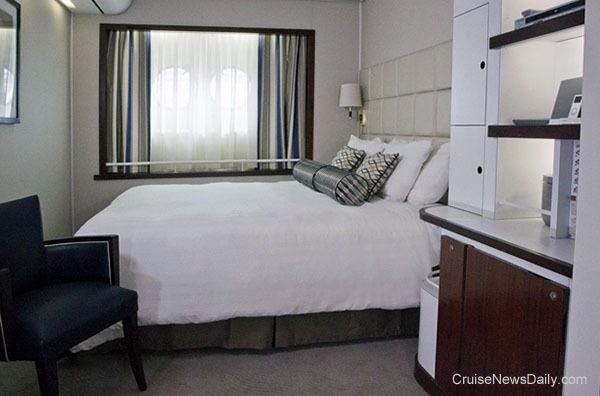 The staterooms have taken on a cool new look with their lighter colors. Country music group, Rascal Flatts will perform aboard Norwegian Spirit during the February 26, 2012, cruise from New Orleans. The intimate acoustic performance will take place aboard the ship while it is docked in Cozumel on March 2. In an unusual method of pricing for cruises, there will be no surcharge for the 7-night cruise itself. It will sell at regular prices through regular distribution channels, but tickets for the concert will be sold separately from the cruise and priced at $50 and $150. Those purchasing the $150 VIP tickets, in addition to the concert, will be going to a private cocktail reception where they will have an opportunity to have their picture taken with the band and receive an autographed souvenir. P&O Cruises has canceled the January 3 (2012) sailing of Adonia for urgent maintenance prior to the ship's 3-month program to South America from the UK. 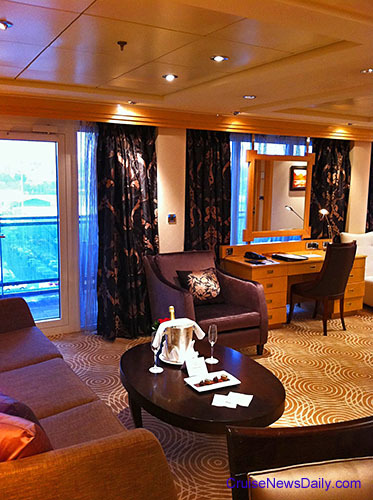 The January 3 sailing was to have been a 10-day cruise from Naples to Southampton. The line is managing to operate Adonia's holiday cruise, which is a 14-night cruise in the eastern Mediterranean from Athens to Naples on December 20. P&O says passengers on the canceled sailing are being given a full refund plus a future cruise credit of 25% of what they paid for the canceled cruise. The line did not disclose the exact nature of the urgent maintenance but said it was an "unavoidable decision." 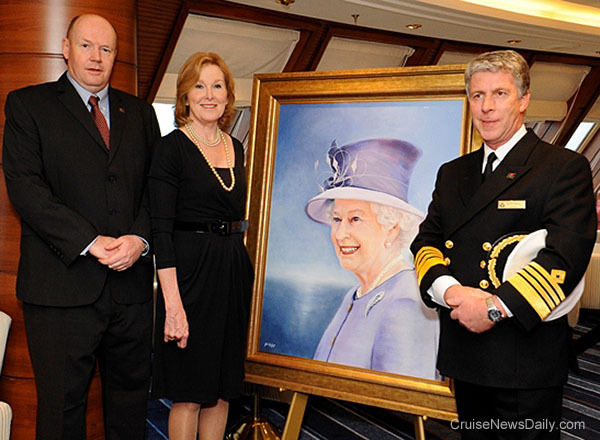 During her recent refit, Queen Mary 2 received a special new piece of artwork. Shown below is a new portrait of Her Majesty The Queen which was commissioned by Cunard, which will hang in the ship's Grand Lobby. The oil portrait was painted by Gail Graham and depicts Her Majesty during her final visit to Queen Elizabeth 2 in Southampton on June 2, 2008. Holland America Line is advising passengers that port calls in Mazatlan and Acapulco have been canceled for sailings through March. This affects both Mexican Riviera cruises as well as Panama Canal itineraries. Virtually all US-based lines suspended calls at the ports due to the potential for violence last winter and extended the revised itineraries through the summer and fall seasons. Most have tentatively left the calls scheduled for this winter season after the first of the year. Mazatlan, especially, has been on a public relations campaign to convince the industry it is safe to visit the city, even bringing in journalists a few weeks ago to visit, with most saying from their experience in the city it seems very safe. (Most probed no more deeply than asking tourism officials if it was safe to visit Mazatlan, however.) Obviously there is more beneath the surface to prompt Holland America to cancel another series of calls over three months. 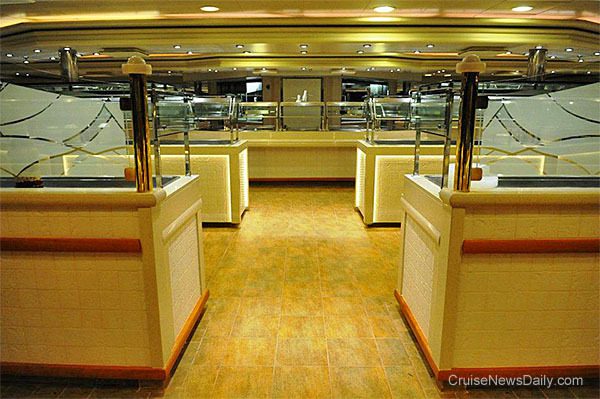 The complete appeared in the December 15, 2011, edition of Cruise News Daily. 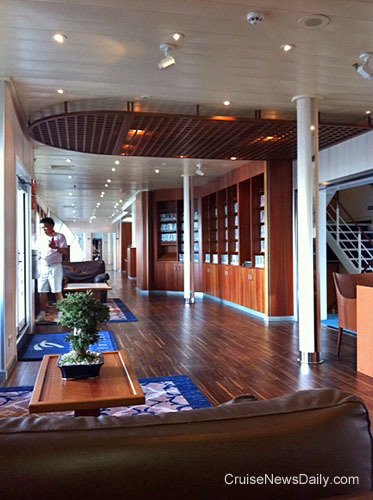 Star Princess has returned to service with some new features which were installed during a three-week refit at the Fincantieri yard in Trieste. 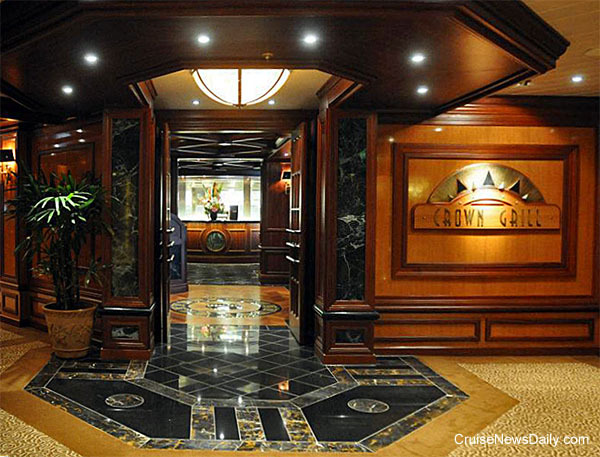 One of the major projects completed was the construction of a Crown Grill steak and seafood restaurant. In the photos below, it can be seen how the Horizon Court was also updated, and the wedding chapel was moved. 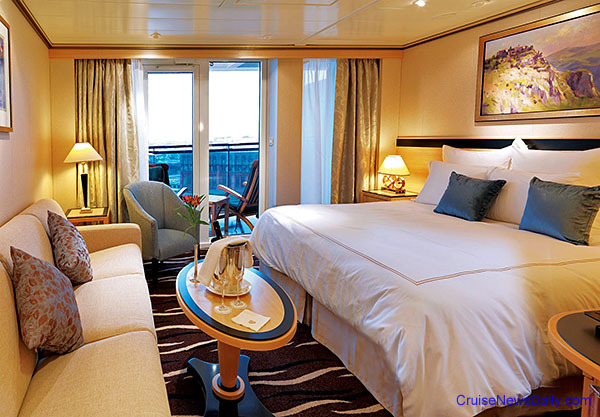 were redesigned similar to the new arrangement on Grand Princess. 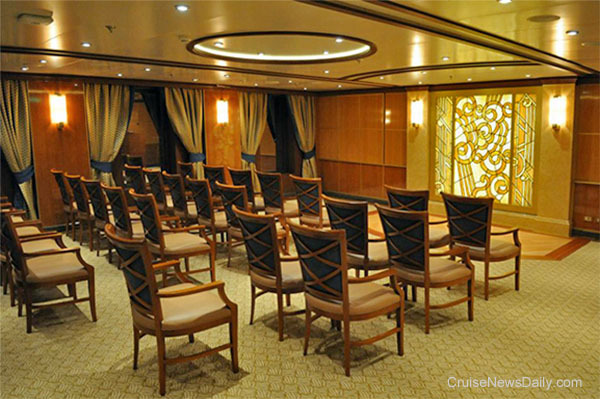 The Serenity Room on Deck 15 became the new Hearts & Minds Wedding Chapel. Movies Under the Stars viewing. 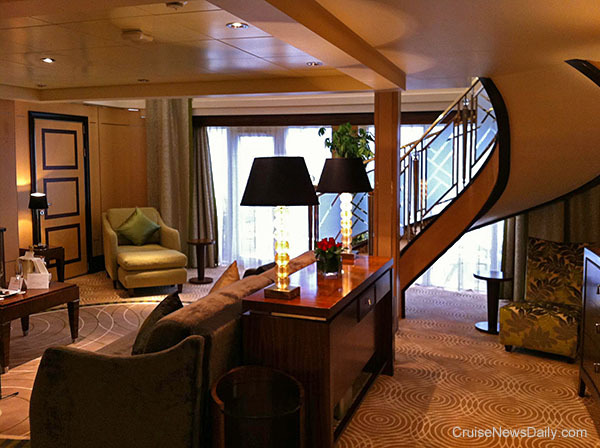 The complete story appeared in the December 14, 2011, edition of Cruise News Daily. A small engine room fire aboard Bahamas Celebration canceled today's sailing from Palm Beach to the Bahamas. The fire resulted from an oil leak in one of the ship's six generators, and according to the line, it was quickly extinguished by the ship's systems. Neither the ship nor the passengers were in danger, the line said. The ship never lost power during the incident, however the fire has affected the vessel's air conditioning. Today's sailing was canceled, and Thursday's may also face cancellation while the air conditioning is fully repaired. 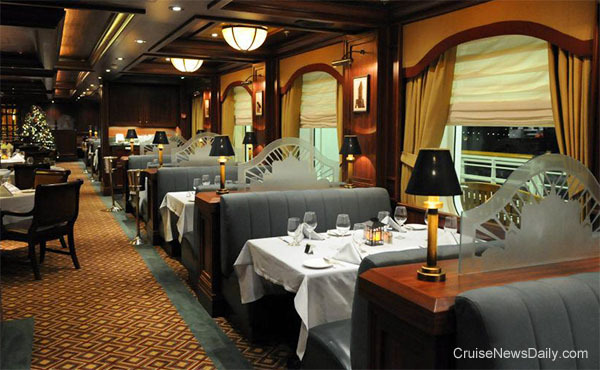 The sailings are now open for sale to past passengers and will open to the general public on December 15, 2011. 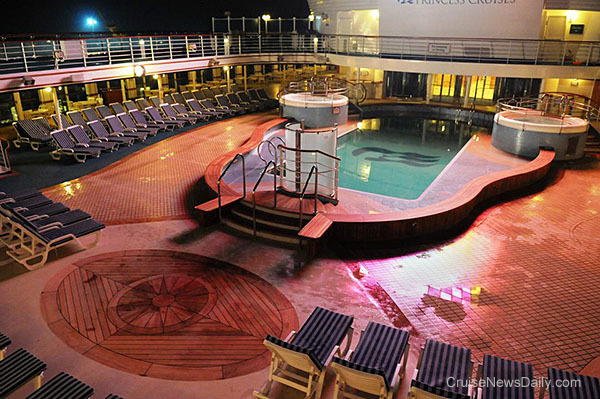 The complete article appeared in the December 13, 2011, edition of Cruise News Daily. 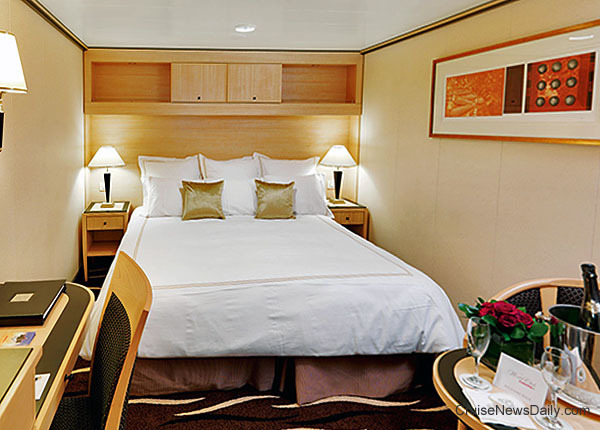 During Queen Mary 2 refit, in addition to the public rooms which we showed you earlier, all 1,310 staterooms and suites also got a fresh new look. Each received new carpeting, bedspread and curtains, and some also had furniture replaced. 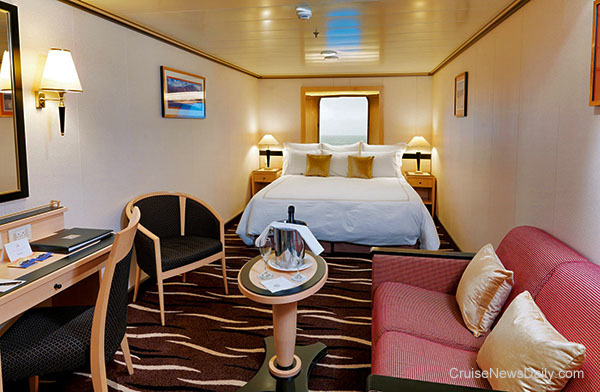 Note the design in the carpeting of the standard staterooms and Princess suites. The design is similar to the tail of the Q in the Queen Mary 2 logo. Royal Caribbean said today their new marketing slogan will be "The Sea Is Calling. Answer It Royally." For the first time, this same campaign will run globally. The new slogan will begin to appear immediately on the RCI website. Then on December 19, a teaser campaign will begin to appear in several key US cities and in banner ads on the internet. Television advertising that expands the full concept will begin running in the US on January 9, 2012. The campaign already began in some international markets last month. This will replace the current "Nation of Why Not?" campaign. 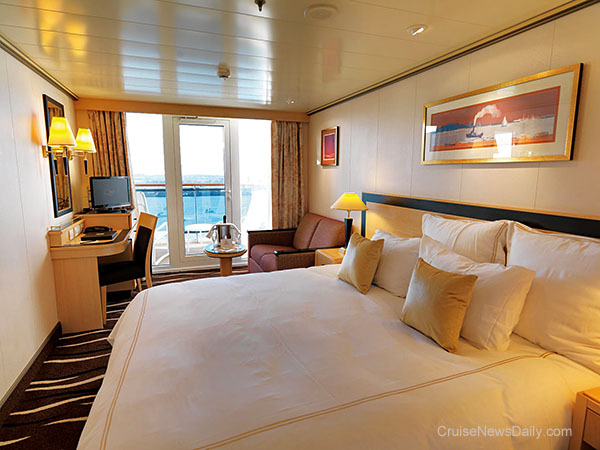 The complete article appeared in the December 12, 2011, edition of Cruise News Daily.